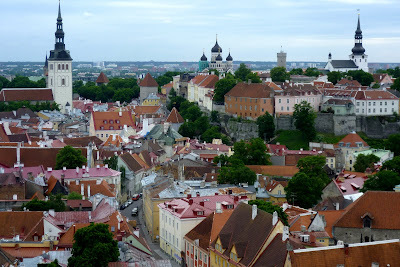 Spent four nights in Tallinn, Estonia. The weather was mostly dreary. I caught a cold, so I was constantly blowing snot and much less social than usual. Tallinn is a tourist hotspot. Very well-preserved and friendly for international visitors. Huge groups of Japanese tourists, no less. A nice place to visit, for sure. The women seemed friendly enough, though hot women seemed less frequent than in Riga or Stockholm. Several women I approached turned out to be prostitutes. This had not been the case in the other cities. There is longstanding tension between the Estonians and the Russians. They share a bloody history. Look it up. At any rate, it's the Russian women who like to flirt. Even if married or "taken" they still engage in friendly flirtation. The Estonian women are far more standoffish. The hostel that we stayed at was run by a bunch of young Australian dudes. It was the loudest, most boisterous hostel yet. Seemed more like a frat house. We went with a group of twenty or so from the hostel to a Midsommar party in the old prison. It was an informal gathering with cheap beer, music, and a bonfire. 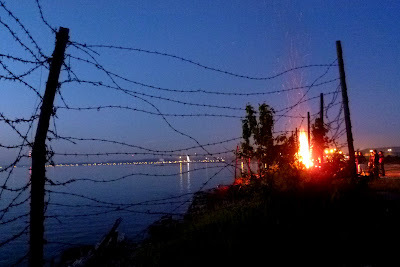 Not many people were in attendance, but it was a great celebration nonetheless because of the eerie setting.